Our office is located in the heart of Lehigh Acres, in the Southwest region of the state of Florida. Whether a family physician, an internist, or a nurse practitioner, primary care providers are often the first contact we have with the health care system. We diagnose and treat common illnesses and spot minor health problems before they become serious ones. We offer preventive services such as flu shots, cancer screening, and counseling on diet and smoking, and play an important role in helping to manage the care of patients with chronic health conditions. The population is rapidly growing while access to acute healthcare is steadily shrinking. 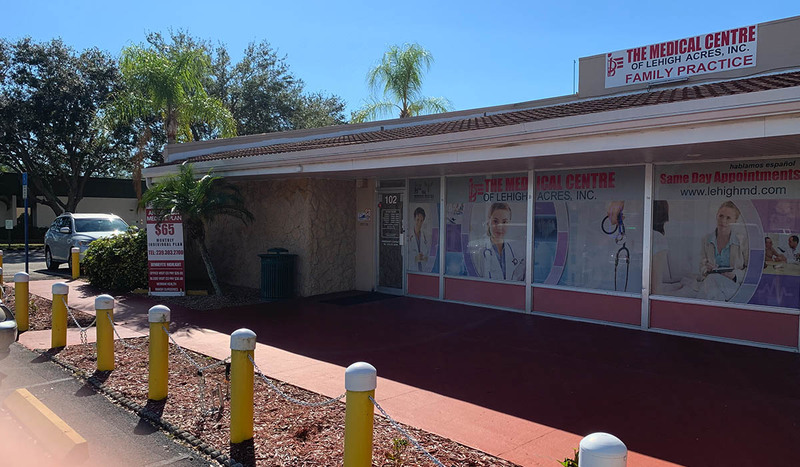 The Medical Centre of Lehigh Acres specialize in treating minor diseases, illness or injuries with a strong emphasis on quality healthcare and convenience. Most uncomplicated medical issues can be easily dealt with in our non-emergent setting.Patients satisfaction will always be our number one priority and we strive to provide both outstanding patients service and quality medical care with short waiting times. We are committed to bringing you better health and a better way of life by teaching and practicing the true principles of the preventive medical care. We understand that many members in our community will benefit with the Health Care Reform also known as Obamacare providing healthcare insurance to the family at low cost with the government tax credit subsidy. However there is a gap in coverage for individuals and families with very low income or without US legal documents. Our commitment is to provide healthcare services at low cost to individuals that are not legible to obtain insurance coverage. We do not verify income or immigration status. Self pay patients are welcome and we continue to offer free-for-services at discounted rates. Our community is in great need of an acute care facility that can efficiently address minor acute medical concerns and decongest its overcrowded emergency rooms. The increase demand for medical services has exacerbated emergency department crowding and lengthened waiting times for primary care appointments. In The Medical Centre of Lehigh Acres we treat each and every patient with the respect and caring everyone deserves when they are ill or injured. We get you in to see the doctor quickly, diagnose and treat the problem then make sure that you understand your diagnosis and have proper follow up. Llamenos para información general o para hacer una cita con un medico de nuestro centro medico que habla español.